Born on 7th April 1897 in Milan, Mario Mantovani was active from an early age in the anarchist movement. Articles signed by him can be found in the Milan anarchist paper Il Rebelle in 1914, when he was seventeen years old. Mario worked as a print worker. The following year in November 1915 he absconded to Switzerland, to avoid the call-up during the First World War and a charge of incitement to revolution, where he contributed to Le Réveil Communiste Anarchiste/Il Risveglio Comunista Anarchico, the bilingual anarchist newspaper edited by Luigi Bertoni. The Italian authorities saw him as "a link between the anarchist milieu of Geneva and Bern," and also a "mediator between the Bolshevik element in Germany, Russia and Switzerland." In 1919 he was in Munich and appears to have participated in some of the events of the German Revolution, being then forced to go into hiding with the crushing of the Munich rising. From there he went to Moscow with the individualist anarchist Enrico Arrigoni (Brand), as a result of efforts by Spartakists to use the ruse of sending them to Russia as repatriated prisoners of war. They were in Russia for three months in early 1919. As they had no documents they were arrested by the Cheka. Fortunately the Bolshevik Angelica Balabanoff interceded and with her help they received disguises as Hungarian prisoners of war with the aim of reaching Italy with documents from the Comintern. In Hungary the Revolution was underway and they met Bela Kun and showed him the Comintern documents. They then proceeded to Vienna and to the Italian consulate, where they claimed to be Italian prisoners of war. This enabled them to return to Italy. At the beginning of 1920 Mario was back in Milan. However the military authorities were on his trial and in March he fled to Spain. Here he held meetings with other Italian revolutionaries in exile. He was expelled from Spain to Italy in March 1921. He was then sentenced to one and a half years imprisonment for desertion and imprisoned at Gradisca. Freed on the 22nd May 1922 he returned to Milan where together with Angelo Damonti he was active in the Political Victims Support Committee. With the coming to power of Mussolini he was again arrested, along with many other anarchists. In June 1928 he secretly crossed the border to France. Under different aliases he lived at Rivery in the Somme in 1929 and then the following year at Fontenay sous Bois. He contributed to the anarchist paper Fede published in Paris from 10th May 1929. He was active in the Pietro Gori Group alongside Camillo Berneri. With the outbreak of the Spanish Revolution he organised a support campaign in Belgium and also served on the executive committee of the Belgian section of the SIA (International Antifascist Solidarity). Arrested by the Belgian police on 11th May1940, he was imprisoned at Bruges and then released several days later. The Nazi occupation of Belgium meant things were getting hotter than usual for him and he decided to return to Italy. On the 17th July he was arrested at the frontier and then sentenced to five years forced residence under surveillance at Ventotene. He was transferred from there to the detention camp of Renicci d’Anchiari on July 1943.With the fall of Mussolini he immediately returned to Milan where he took part in armed action and helped set up the anarchist partisan unit the Malatesta-Bruzzi Brigade with Antonio Pietropaolo and Mario Orazio Perelli and served as its political commissioner. He took part in the armed combats to liberate Milan from the fascists on 25th April 1945. He set up, along with Ivan Aiati, the anarchist paper Il Comunista Libertario in Milan. This was the organ of the Italian Libertarian Communist Federation (FCLI) and ran from December 1944 to 5th October 1945 for 16 issues, appearing as an underground paper to begin with. He then published its successor Il Libertario which ran from 13th October 1945 to 15th September 1961. He took part in practically all the conferences of the Federazione Anarchici Italiano (FAI). In the fifties with the organising of the Platformist current around Pier Carlo Masini within the FAI, the Gruppi di Anarchici d’Azione Proletaria, he tried to act as a mediator offering the GAAP a column in Il Libertario for which he was harshly criticised by the Galleanist current around the paper L’Adunati dei Refrattari. 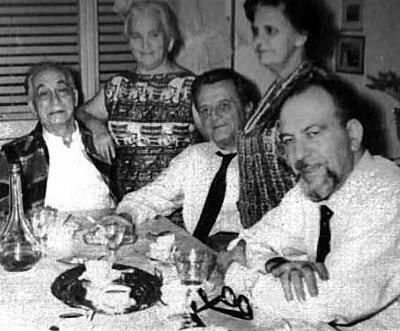 With the closure of Il Libertario in 1961 Mario moved to Rome where in 1966 he became involved in editing and running the FAI paper Umanita Nova up until 1971. He was one of the delegates at the International Anarchist Congress at Carrara in August 1968. He then returned to Lombardy where he died at Limbiate on 4th March 1977.